Entering last night’s start against the Oakland Athletics, Rich Harden had been largely ineffective in his new role as the ace of the Texas Rangers pitching staff. Through his first five starts, Harden had only pitched 23.2 innings with a 4.56 ERA and an atrocious 6.97 FIP, thanks in large part to an 8.75 BB/9. As that suggests, Harden has been throwing a ton of pitches this season – he had thrown at least 87 pitches in every start so far despite only throwing more than 4.1 innings twice. As Harden is a high-strikeout, high-walk pitcher, it’s unsurprising that he typically runs high pitch counts. Harden’s calling card with the Cubs last year were brilliant, 10 strikeout games in which he would be forced to leave after five innings and 110 pitches thrown. Also, given his injury history, pitch counts are often at the front of his manager and GM’s mind during each of his starts. Harden’s pitch counts have been highly correlated with his success through his career so far. Below is a chart of average pitches per inning on a per-game level plotted against game WPA. We see a strong correlation, and, in particular, a striking trend: if Harden can keep his pitches per inning below 16, he will almost certainly enjoy some level of success in his starts. He’s only run a negative WPA three times in 61 career starts in which he’s thrown 16 pitches per inning or fewer. The results are less conclusive as Harden’s average pitches per inning increases until his average pitches per inning eclipses 23. After that point, 75% (12 of 16) of his starts have resulted in negative WPAs. 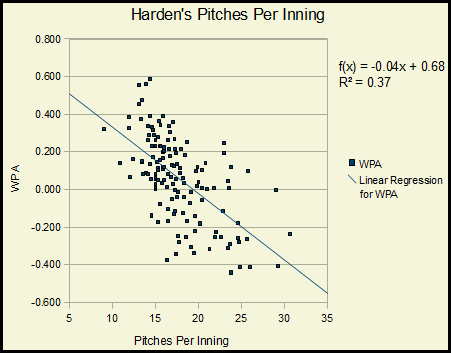 Four of Harden’s first five starts resulted in an average pitches per inning above 17, with an average WPA of -.126. The other – his most recent start, prior to last night – saw Harden throw an average of 14.5 pitches per inning, right on the threshold where Harden is guaranteed to be above average. By WPA, Harden was +.056 in that start, despite 5 walks and only 2 strikeouts – not the most effective start, but he managed to record 8 ground ball outs, which were key in escaping with only three runs allowed in six innings. Harden’s start on Monday was his best yet and by far. Harden went 7 innings and allowed no runs, striking out nine and walking none. He threw 108 pitches in the start, for an average of 15.4 per inning. That’s right in the range that Harden should be shooting for – as a strikeout pitcher who also gives up a lot of fly balls, Harden should look to avoid contact, and as such he will encounter many at bats of multiple pitches. Of course, throwing fewer pitches generally means facing fewer hitters, leading to fewer runs. With Harden, however, his pitch counts will remain an issue for reasons other than his effectiveness. Due to his style of pitching, more pitches generally means more walks, which will kill any fly ball pitcher. Secondly, given his injury history, it is certainly in the Rangers best interest to keep Harden’s pitch count low. If he’s struggling to get through 6 innings in less than 100 pitches, keeping Harden’s arm out from under duress will mean that he’s not giving them enough innings to provide value in the first place. Monday night’s start was a great sign on nearly every front for the Rangers and Rich Harden. If he can remain as efficient as he was in that start while maintaining the knockout stuff that allows for nine strikeouts in seven innings, he will be a key piece in a team that is emerging in a tight AL West. We hoped you liked reading Rich Harden and Pitch Counts by Jack Moore! Duh. The only way you are throwing 25 pitches per inning is if you are giving up baserunners. Baserunners generally = bad. If you are only throwing 15 pitches per inning, you probably aren’t giving up those runners. Maybe pitches/batters faced would show something more insightful? I doubt it will be, but it might.